Burritos, tacos, quesadillas- all of these just make your mouth water! And of course, they all sound delicious because who doesn’t love a good Mexican food fiesta? The food is as vibrant and flavorful, interesting and slightly exotic Mexican food truly reflects the country as it is full of complex flavors and exciting tastes as Mexico itself is exciting and interesting as well. Of course, this is why Mexican food is so popular- it just really is so good! We all know that is true. However, let’s face it, we all also know that it isn’t exactly a dieter’s dream. This tasty cuisine tends to be loaded with sugars, starches and other carbs that you may be trying to avoid. That is not good for anyone who is on a low carb diet or for anyone at all. 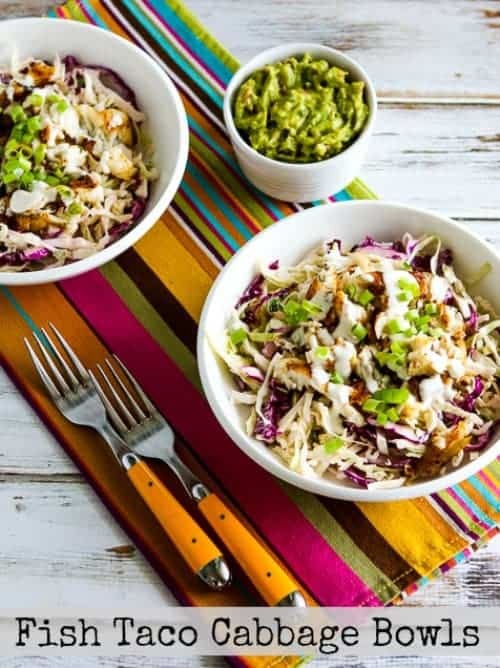 The fact that you are reading this blog about low carb Mexican food means that you don’t want that traditional Mexican food, you really want something that is healthier and better for you. So does it exist? Can you really have low carb Mexican food? What is a dieter to do?! Give up Mexican cuisine? Never! There has to be a better solution. Luckily for you, there is! You can make so many Mexican dishes low carb and you most likely won’t even notice the difference in taste. That’s right, low carb and full of flavor- who knew it was possible! This list is a compilation of all the best, easiest and most flavorful Mexican dishes around. And the best part: they are all low carb! Now, you don’t even have to think about if the food is part of your diet or not. If it is on our list, it has passed the low carb test and you are good to go! No need to think, just time to cook! 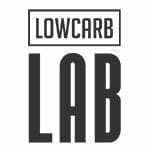 Each of these recipes has been checked and has passed the low carb test. They are all lacking in unnecessary sugars and are approved to eat on any low carb diet. Isn’t it great when you don’t even have to do any research and you can just cook and eat without a care in the world- simply amazing..And, just to reiterate because it is so important, you can still eat Mexican food despite your diet!! That is the best part, after all. Okay so we have verified that these recipes are all low carb (check!) and that they are all Mexican inspired which will satisfy your craving for Mexcian foods (check again! ), but now, what about their taste? Because even if the food is low carb and Mexican, that doesn’t necessarily mean that you want to eat it. But guess what, it is all delicious. Every single recipe is a winner and is not only going to satisfy your craving for Mexican food but also make you want to keep coming back for seconds and thirds (and go ahead, it is low carb!). Of course, the flavor is one of the most important parts of cuisine, especially Mexican cuisine where you really want to have all of those authentic flavors. That is what you are craving right? You just need all of the Mexican tastes without all of the Mexican carbs! You can also check of authentic flavors from your list as these recipes have that covered. Mexican foods really do have a flavor all of their own. Spices like chili and cilantro, lime and tequila (of course!) make up the essence of this cuisine. This flavor carries through to each of these recipes. 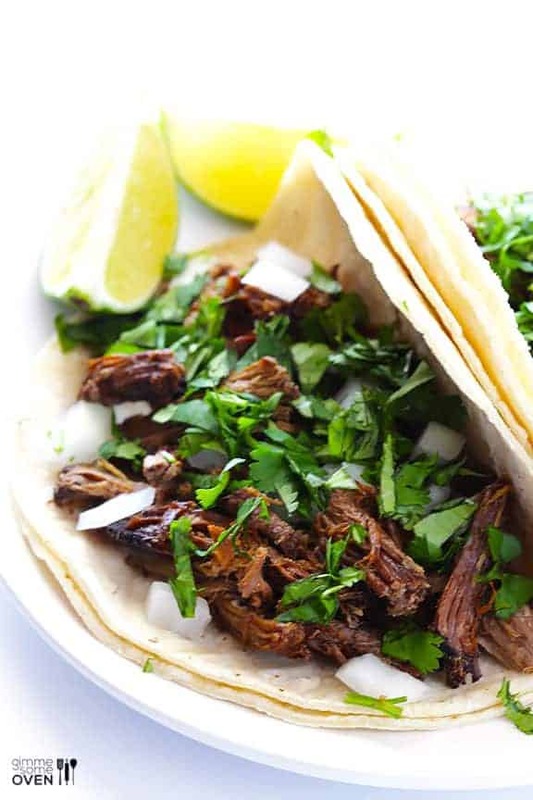 Close your eyes and take a bite and you will instantly know you are eating Mexican food- can’t confuse any of these recipes with Chinese food or Italian dishes! The spice and flavor is all there. Ingredients are also essential to creating a true Mexican food experience. Luckily, these recipes are all made with very authentic ingredients so that each dish screams of Mexican ingenuity. With ingredients like jalapenos, cactus and poblano peppers, you will surely get that Mexican feel in all of the recipes. In fact, you may like these even more than traditional, carb filled recipes. You will get to eat plenty of food, enjoy all of the flavors as they mingle together in your mouth and not feel full or bloated after eating. Take out those carbs and you also take out that feeling of being weighed down after a meal. Bye bye carbs, hello content eating and resting comfortably afterwards. Seriously though, if you just take one bite and you’ll be hooked! So there is flavor but maybe you are still questioning how you can even make Mexican foods be low carb. After al, Mexican cuisine is loaded with beans, tortillas and rice- carbs, carbs, carbs! What is even in a low carb Mexican dish and how can you make the foods you are addicted to a little less carb heavy. This is a great question. The first food item to tackle is the tortilla. Mexican foods are almost always all about the tortilla (and why not, the are delicious!) so how can you make a carb loaded tortilla go away when youre talking about Mexican foods? Simple enough! There are plenty of low carb tortilla options in the stores. All you have to do is grab the back that is labeled low carb and you are all set! You can also skip the tortilla whenever possible for the ultimate low carb experience. Next on the chopping block, the beans. Beans are carb heavy and you may think there is not much you can do about that. Well, in this case, you are kind of right. Beans are always going to be high in carbs. You can cook the beans with low carb ingredients to cut a little bit of carbs but the best idea is just to reduce your bean consumption. Sorry, but this one is a little tricky. Carbs pop up in traditional Mexican drinks all the time as well. Those agua frescas you may love are typically sweetened with a lot of sugar. This problem is a simple one however. Take out the sugar and add low carb sweetener or nothing at all. That Agua fresca and those rompompe egg nog drinks will be low cab in no time! If you are making Mexican sauces and need to thicken the sauce, you may usually reach for some flour or masa. Not this time! What you need instead of masa to thicken your sauce is a little bit of xantham gum. This is a much lower carb, no flavor needed type of chemical thickener that you can easily use rather than flour. Rice is a killer when it comes to carbs and it is also an integral part of Mexican cuisine. Luckily, there are many easy rice substitutions you can use to still have the texture and taste you love from rice but without the carbs. Rice cauliflower has to be the most popular and versatile substitution and you will find that in a lot of these recipes. 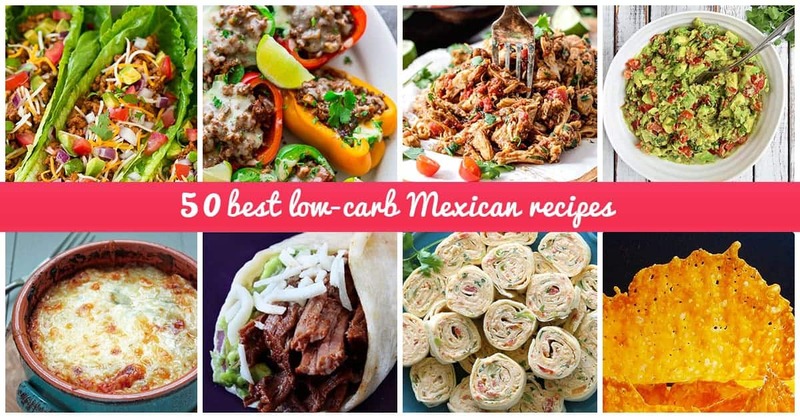 Of course there are many Mexican foods that are already low carb and that ended up on this list because they are naturally ready for you low carb dieters to eat! Guacamole and salsa are both very low carb while also being just darn delicious. With these, you just need to watch out for those chips the restaurant may give- those obviously have way more carbs that you want! stick with a carrot stick or celery instead! The meatier Mexican dishes are something you can focus on as well. Fajitas for example, are typically a hot plate of meats and veggies. They are usually served with tortillas but you can simply skip that part and have true Mexican fajitas in a low carb fashion. The same goes for carnes asada, a juicy, tender beef that is already low carb and ready for you to enjoy as is- no substitutions needed! While cooking at home is ideal especially when you are on a diet and trying to watch your carbs (knowing what is in all of your food is essential! ), the truth is that you will likely dine out a few times while dieting. Mexican food is probably what you will end up eating too! The key here is to know what to ask for in the restaurant to keep your meal low carb. As mentioned before, guacamole, salsa, carne asada and fajitas are all good low carb choices. Chiles Rellenos, Chili Verde, Mexican Salads and carnitas are also great low carb Mexican dishes that you can choose. If you have your heart set on something else on the menu, ask for no tortillas, no rice, and no beans then ask if you can have extra meat instead. These quick changed will work in a pinch and certainly cut back on some of the carbs that may have been trying to sneak their way on to your plate. So you see, a few simple ingredient changes and you’ll be eating low carb Mexican foods right away! You don’t necessarily always need a completely different recipe from those delicious, classic Mexican recipes you already know and love. All you need to do is be aware of what is in the food, change it a little and continue on, eating as happily as ever! However, if you want to fully commit and make sure everything you are eating is low carb, then new recipes may be needed. And that is when this amazing list comes in! The flavor is there, the low carbs are guaranteed and the Mexican authenticity is accounted for as well! Okay so now you are assured that each of these recipes have good flavors. You know they will taste like Mexican foods you know and love and have some easy substitutions when compared to traditional Mexican foods. But what about time? Doesn’t it take a while to prepare really good Mexican food? Don’t you need to slow cook meats for hours, hand roll corn tortillas and prepare sauces all day long? If that is the case, no one has time for Mexican food, low carb or not. Don’t you worry- you know that we only chose meals that would be easy to make in addition to all of the other benefits (this list of reasons to make these meals right now is getting pretty long!). So, in addition to being full of flavor, there are plenty of Mexican dishes that you can whip up and serve in no time. All of these recipes really don’t take too long especially when you consider that they are part of your diet and something that you can eat anytime you’d like- worth the effort for sure! It can be time-consuming to make a full, tasty meal after a long day and not many people have the time or energy to do this. When you switch to your low carb diet, you also are probably battling all day with feelings of hunger and the need to just eat right away- no one wants to be cooking for hours just go have Mexican food! Many people just can’t commit to any lengthy recipes for just this reason. 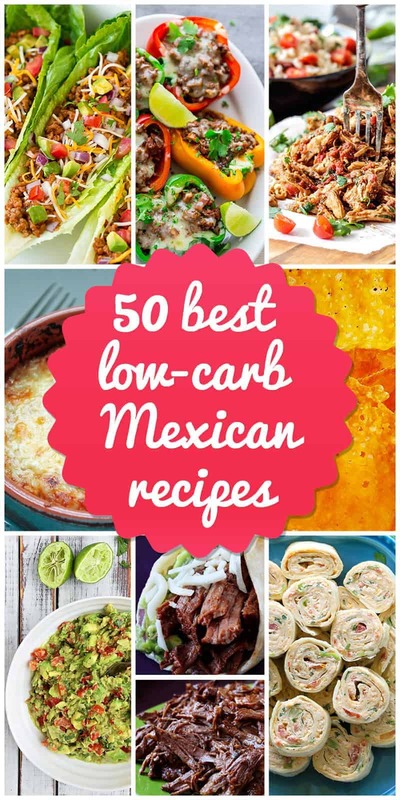 Lots of the low carb Mexican dishes on this list will only take a matter of minutes to put together which means that you can be eating in no time! In fact, you could probably cook eat and clean up all within an hour. That has to be the fastest Mexican food every! Since you made the meal so quickly, you’ll have time to eat seconds…and thirds. And who are we kidding? Probably even fourths. Of course, make sure that you are eating the proper amount of calories along with monitoring your carbs. Low carb is great but you may want to reconsider that seventh taco (I know, they are so good that it is hard to resist!). So let’s take a break and recap how great these recipes are. Low carb, delicious, authentic Mexican, and quick to make. Do you really need anything else? This list of credentials seriously checks off every box- can you believe that is even possible?!? Who knew that after years of eating carb laden Mexican foods, you could have been eating healthy the whole time and still gotten the tastes that you were craving. All those years, wasted on bad Mexican food! Thank goodness you have some great options here and now! So, as you can see, that new low carb diet you have taken up does not require you to give up your favorite food. Let me say it again to make sure you heard and are ready to eat: there is no reason to give up on Mexican foods just because you are on a low carb diet. In fact, you can have as much of it as you want off to this list. Thank goodness! If you did have to skip all Mexican foods just because of your diet, that may be reason enough to quit it before you even begin! Don’t fret though. There’s no need to say adios to the delicacies of Mexico just because you need to cut carbs. In fact, you can start living a healthier, carb conscious life with Mexican foods by your side. It’s like a dream come true. You can get a healthy dose of protein and plenty of Vitamin A and C with these cheesy stuffed Mexican peppers. This dish is a certified people pleaser being vegan, gluten-free and low-carb- how is that even possible?! 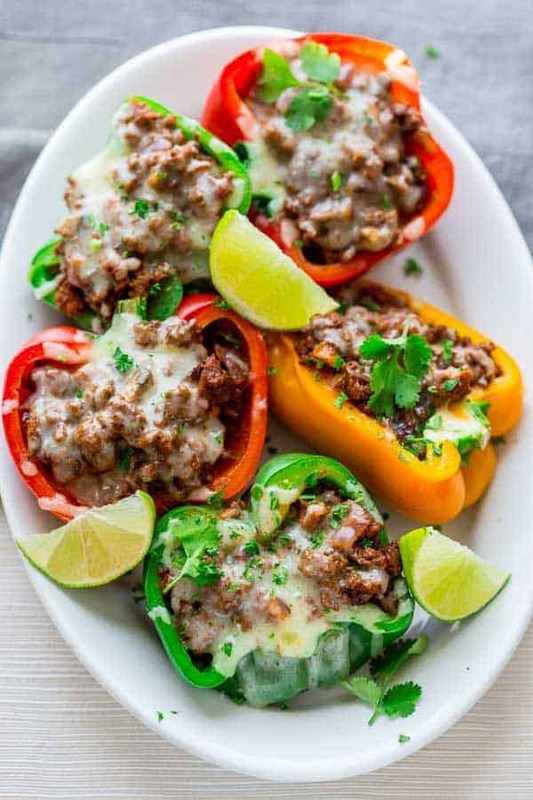 Fresh bell peppers stuffed with grass-fed beef and smothered in gooey melted shredded cheese make this an irresistible delight. The simple ingredients make this an easy dish to put together so it’s perfect for those nights when you’re not in the mood to cook but don’t want to get stuck with frozen pizza or takeout. Turn to this dish and you will end your night in the best way. Barbacoa is a traditional Mexican dish prepared over an open fire or pit covered with maguey leaves. Although most of us aren’t able to roast meat over a fire pit, you can still enjoy the tender and flavorful meal with this low-carb recipe. Traditional barbacoa is made with goat, but chuck roast works just fine and you may even like it better! Just throw it in your slow cooker in the morning and prepare to be wowed come dinnertime with its juicy, savory taste, complemented by the spice of green chilies and the sweetness of roasted onions. Can’t get any easier or tastier than that! If there’s one no carb Mexican recipe that everyone wants to know, it’s guacamole. The smoothness of this classic dish can’t be understated- it is pure perfection. Whether it’s topping off your burrito or being piled high on salty tortilla chips, there’s no way you can bypass this party essential. 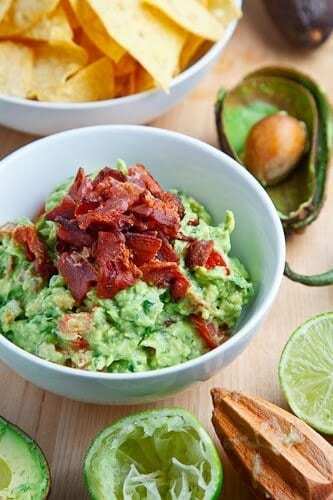 This guac is even better because it’s topped with four strips of crispy bacon. Talk about a total win! Your low-carb diet doesn’t have to be boring, and this fish cabbage bowl is definitive proof. This dish is gluten-free and South Beach Diet friendly, so you’ll want to add this to your growing collection of Mexican low-carb recipes stat. Baked Tilapia and a spicy, lime-infused sauce that can be used on plenty of other dishes is what makes this recipe perfect for lunch or dinner, and it’s simple ingredient list means you can whip up extra for leftovers. Fast, tasty and low carb- this checks all the boxes. Few things warm a soul up quite like hot chocolate. You may not immediately conjure up this drink when thinking of carb-free Mexican recipes, but take my word for it: this is one you don’t want to pass up. 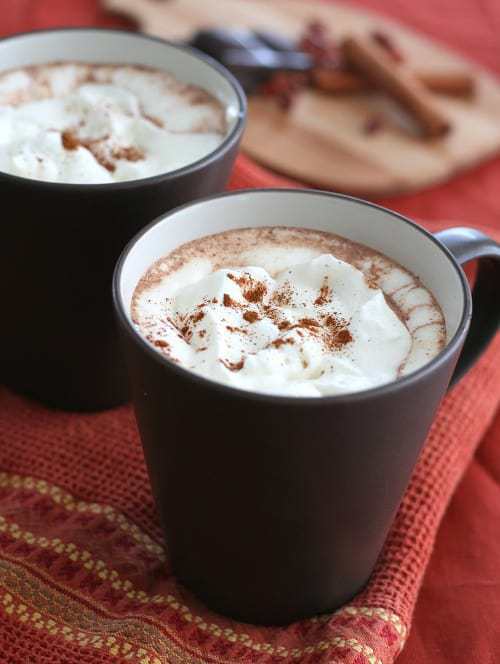 This low-carb, gluten-free hot chocolate is pure heaven made from almond milk, heavy cream and cinnamon. What makes Mexican hot chocolate different from Swiss Miss? The unexpected yet glorious dash of chipotle powder and cinnamon. Pour yourself a cup and curl up with a good book as the perfect way to end your day. Cheese and Mexican food go together like peanut butter and jelly, and this is one of the most indulgent low-carb Mexican recipes you can feast your eyes on. 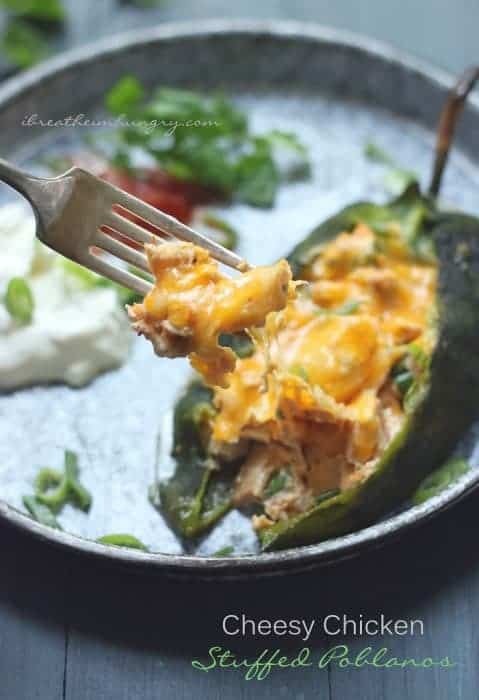 Spicy, roasted Poblano peppers are stuffed to the brim with mounds of gooey Kraft cheese, shredded chicken and topped off with salsa. Are you drooling yet? 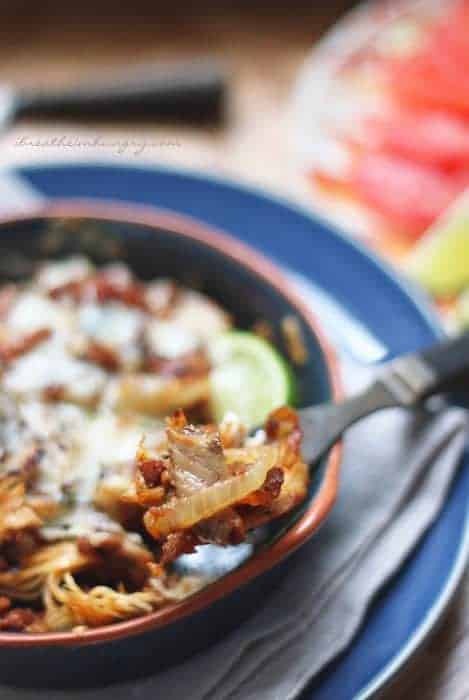 If you love a good casserole, the thick consistency and cheesy texture of this dish make it the ultimate Mexican cheat dish for you. If you’re on a strict low-carb diet and want to up the health-factor, you can cut back the amount of cheese used and instead focus on the shredded chicken. The peppers are also full of nutrients that will compliment a healthy lifestyle. The absolute essential of carb-free Mexican recipes. When you learn how to whip up no-carb taco shells, you’ll practically be unstoppable! One of the biggest challenges for those on a low-carb diet are finding low-carb foods that still carry a powerful texture along with flavor. Well, few foods can come close to beating the satisfying crunch of a taco shell, right? The magic of this no carb Mexican recipe lies in the queso. Cheese is melted down, toasted and salted to perfection. Making these bad boys will have you wishing every night could be Mexican night (and it can with all these recipes!). One of the best high fiber low-carb foods is cauliflower rice. This is one of the many fantastic low-calorie Mexican recipes that you can change up and use for plenty of other meals too. Rice is a staple of almost every Mexican dish, and with this rice, you still get all the spice, seasoning and satisfaction without the guilt that accompanies scarfing down a whole bowl. 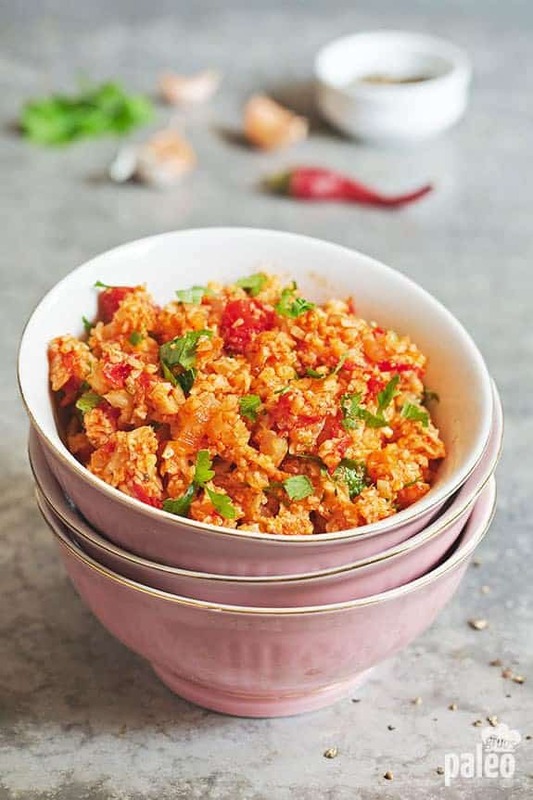 Thank goodness because it wouldn’t be Mexican food without delicious rice!Eat up, be merry and start using the versatile cauliflower rice to satiate your low-carb diet side dish needs. Mexican low-carb recipes don’t skimp on flavor, which is why they’re so great to pick up when you’re trying a new low-carb diet. 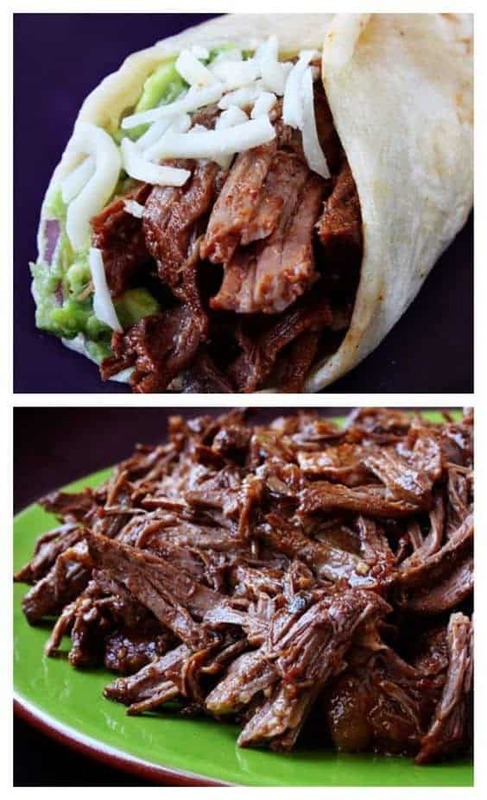 Shredded beef is easy to make and can be used for so many other recipes, so make sure you prepare extra and not just because you can use it for other dishes, but because you’ll absolutely be wanting seconds of these juicy tacos. Seasoned with chipotle peppers, cumin, smoked paprika, garlic and onion, this is a recipe that has layers and layers of delicious Mexican flavors. Chori Pollo is must-try for any fan of Chorizo who also wants to eat more low-carb foods. Seasoned chicken is cooked and served with Mexican Chorizo, mouth-watering caramelized onions and of course, plenty of melted cheese which is luckily very carb friendly. This recipe is very simple and tastes just as good reheated as it does freshly served. With a recipe that serves six, you can either have plenty of yummy leftovers to look forward to or feed the whole family on one delicious, low-carb meal that they’re sure to ask for again. Freeze some and save it for the next time you have a Mexican craving.